you want begging to marry you in no time. It's true! Well, almost. cheesecake has cooled. I did it when it was warm. Mistake. Just ask Andrew. He eats a cheesecake a week these days. "You can make this? Really?" Combine ingredients. Press into bottom and 1/2 inch up side of 9-inch springform pan. Bake 8 minutes at 350 degrees. Cool. Make crust. Set aside. Preheat oven to 450 degrees. In large mixer bowl, combine cheese, 3/4 cup of the sugar, sour cream and 2 tsp. of the vanilla; beat until smooth. Slowly add flour. Add eggs one at a time, beating well after each. In a small bowl combine coca and remaining 1/4 cup of the sugar. Add oil and remaining 1/2 teaspoon of vanilla and 1 1/2 Cups of the cream cheese mixture, and blend well. 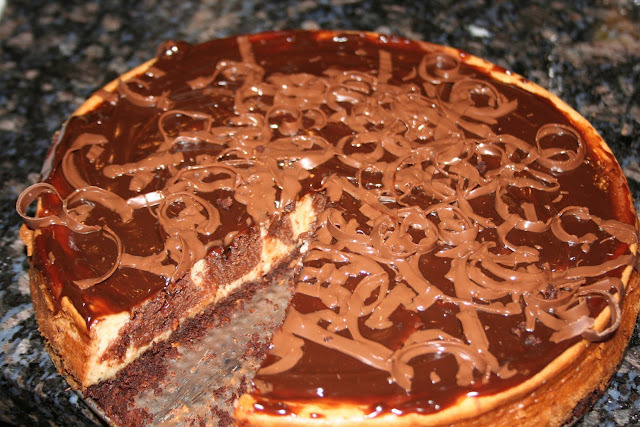 Spoon plain and chocolate batters alternately over crust, ending with dollops of chocolate on top. Swirl with butter knife for marbled effect. Bake 10 minutes. Leave oven door shut and reduce temp. to 250 degrees. Bake 30 minutes. Then turn oven off and leave in oven 30 minutes more still leaving the door shut! Loosen cake from rim. Cool. Chill. 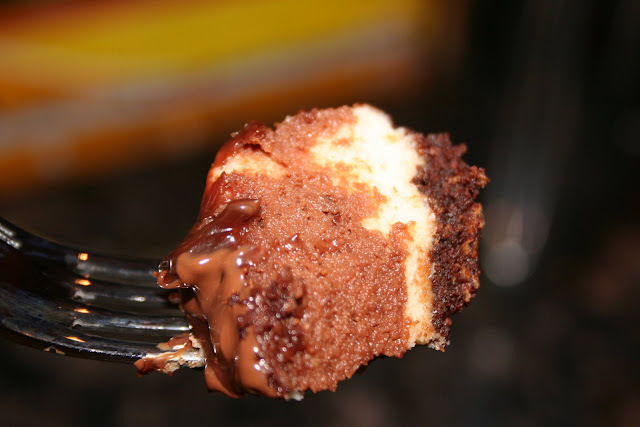 If desired, warm hot fudge slightly and spread over top of cake. With a carrot peeler, peel chocolate curls off of candy bar and place on top. This cheesecake is just as good the next day, or even the next, so you can make this ahead if you like! 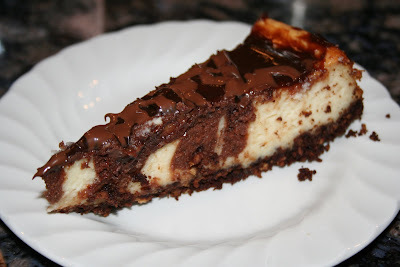 If you are a cheesecake lover, you have to try this one!